It is difficult to achieve remediation objectives at some contaminated sites because of complex, site-specific conditions. Remedial success at these complex sites may ultimately depend on integrating multiple remediation and risk management approaches and on long-term management. This section describes the need for additional guidance for remediation management of complex sites, what makes a site complex, and the significance of complex sites. Because remedial success partly depends on remediation objectives and the acceptable time frame for achieving them, this section provides a brief background on site objectives and interpretations of reasonable time frames for achieving them. Adaptive site management is a comprehensive process for managing remediation at complex sites and is presented as a framework for decision making. Despite previous relevant guidance on aspects of remediation at complex sites, no comprehensive guidance document describes the elements, tools, and options for successful remediation at complex sites. This guidance presents a process for managing remediation at complex sites and describes each step of the adaptive site management process. This guidance does not offer short cuts or the means to avoid site remediation, but rather describes how complex sites can be managed effectively to ensure protection of human health and the environment and progress towards site objectives. Effective management can streamline decision making, decrease remediation costs, and potentially reduce remediation time frames. Ultimately, this guidance describes adaptive management principles that can lead to better decision making and remediation management at complex sites. ITRC guidance is intended to benefit a variety of site decision makers, including regulators, responsible parties and their consultants, and public and tribal stakeholders. Terms and definitions vary among different environmental remediation programs. To avoid confusion, this guidance consistently uses a narrow set of terms defined in the Glossary. When possible, this guidance uses common terms that are not associated with a narrow, legal or policy definition. Acronyms are defined in Appendix E.
For the purposes of this guidance, ITRC defines a complex site as a “site where remedial approaches are not anticipated to bring the site to closure or facilitate transitioning to sustainable long-term management within a reasonable time frame”. Complex sites typically have multiple attributes that present remediation challenges and therefore take much longer to reach site objectives compared with typical sites. ITRC uses the term “complex site” because this guidance focuses on the technical challenges and additional nontechnical factors, similar to the focus of the National Research Council (NRC 2013). The remaining number of Superfund sites that have not reached the completion stage includes area-wide groundwater sites, mining sites, sediment sites, and federal facility sites. The size and complexity of these remaining sites generally indicate longer project durations and increased costs required to complete cleanup construction. There is now a greater number of federal facilities and very large and complex sites (sites exceeding $50 million in cleanup costs) as a percentage of National Priority List (NPL) sites not yet completed than ever before. Of the remaining 675 final NPL sites that have not reached construction complete, 138 are federal facilities and an additional 93 sites are very large and complex sites. Although progress has been made in remediating many hazardous waste sites, there remains a sizeable population of complex sites, where restoration is likely not achievable in the next 50-100 years. Although there is no formal definition of complexity, most remediation professionals agree that attributes include areally extensive groundwater contamination, heterogeneous geology, large releases and/or source zones, multiple and/or recalcitrant contaminants, heterogeneous contaminant distribution in the subsurface, and long time frames since releases occurred. Additional factors that contribute to complexity include restrictions on the physical placement or operation of remedial technologies and challenging expectations (such as regulatory requirements, cleanup goals, and community expectations). The complexity of a site increases with the number of these characteristics present. A site with substantial technical and nontechnical challenges typically has a longer remediation time frame, higher remediation cost, and larger environmental footprint (such as energy use or carbon emissions), particularly if site challenges are not adequately understood and addressed early on. Conversely, complex sites have a greater potential for cost savings, environmental footprint reductions, beneficial land reuse, and other societal benefits. The largest and most complex Superfund sites must be managed as multi-year construction projects. This is particularly true of the “mega-sites” with estimated costs over $50 million. USEPA-funded mega-sites consume the majority of resources. In fiscal year 2005, approximately 50% of the Superfund obligations for long-term, ongoing cleanup work were committed to just eleven sites. The Agency expects to have a similar situation this year. In 2011, the Strategic Environmental Research and Development Program and the Environmental Security Technology Certification Program (SERDP/ESTCP) compiled data from 588 Army, Navy, Air Force, and Defense Logistics Agency sites where groundwater remediation will not be completed until at least 2022. The greatest costs for cleanup of these sites were associated with source zones, groundwater, landfills, underground storage tanks, and surface disposal areas. Among these sites, 90% had cost-to-completion estimates of less than $14.3 million, and 10% of the sites had cost-to-completion estimates ranging from $14.3 to $122.2 million. Thus, 31% of the sites accounted for 80% of the total cost-to-completion (Vogel 2015). Green remediation is the practice of considering all environmental effects of a remedy and incorporating options to maximize net environmental benefit of cleanup actions (USEPA 2011b). This practice uses natural resources and energy efficiently, reduces negative effects on the environment, minimizes or eliminates pollution at its source, and reduces waste. GSR is similar to green remediation but also considers community goals and economic effects, as well as environmental effects (ITRC 2011a). The approaches discussed in this guidance are key tools in achieving the goals of GSR for complex sites. Sites with a high cost of remediation also tend to have a high environmental footprint, including consumption of large amounts of energy and other resources, emission of greenhouse gases and criteria pollutants, and waste generation. Promoting more efficient approaches to managing complex sites improves the sustainability of remediation programs and is consistent with the objectives of green and sustainable remediation (GSR). Complex sites may have a greater potential for land reuse and other societal benefits. Economic benefits can also accrue from remediating complex sites. One study found that brownfield site assessment or remediation can increase nearby residential property values by 5 to 15% and (based on anecdotal surveys) reduce crime (USEPA 2016b). Site remediation can mitigate damage to public resources and improve resource availability, restoring clean drinking water, hunting, fishing, and recreational land uses. Site remediation can also decrease public health risks, reduce stigma, improve commerce, and avoid the loss of cultural practices. Site remediation can mitigate these effects even when sites are not restored to a condition that allows for unlimited use and unrestricted exposure (for instance, at Brownfields sites). Restoring the beneficial use of land, surface water, groundwater, and other natural resources can benefit municipalities, rural residents, tribes, and others. Remediation at complex sites is guided by the site objectives. This guidance uses the term “site objectives” to describe the overall expectations for site remediation. Site objectives are typically established based on regulatory requirements, regardless of the technical ability to meet them. Examples include applicable or relevant and appropriate requirements (ARARs), other federal and state standards, and target risk levels that are protective of human health and the environment. Factors that are considered in establishing site objectives at Comprehensive Environmental Response, Compensation and Liability Act (CERCLA) sites are outlined in 40 CFR 300.430(e)(2)(i). These factors include meeting identified ARARs or justifying a waiver of specific ARARs, while still reducing risks to human health and environment and returning the site to beneficial use (ITRC 2012). Site objectives are the overall expectations for a site, which include protecting public health and the environment. If site objectives are not achievable within a time frame that is agreed upon as reasonable, then revisit the site objectives may be necessary. Interim objectives are intermediary goals that guide progress towards achieving site objectives. At complex sites where regulators agree it is impracticable to achieve default expectations (such as drinking water standards), regulators may require alternative site objectives, such as restoring affected media to beneficial use while protecting human health and the environment. At complex sites where it is not technically or economically practicable to restore affected media to beneficial uses, regulators may establish site objectives for source removal, containment, and exposure prevention. At these complex sites, community engagement will likely be an ongoing component of the remedy. When establishing site objectives, a thorough conceptual site model (CSM) can best represent site complexities, define remediation potential based on site complexities, and may inform the identification of ARARs or the development of site-specific target risk levels and exposure pathways of potential concern. The term “interim objectives” is used in this guidance to describe intermediary goals that guide progress towards achieving site objectives. Interim objectives are sometimes termed “functional objectives” (ITRC 2011b). They may reflect technology-specific goals and nearer-term remediation goals. Setting interim objectives and associated performance metrics helps to keep the remedy on track to ultimately achieve site objectives. Interim objectives can be developed in parallel with remedial alternatives for each affected media or site area. Scenario: Chlorinated solvents are present in a residential water supply well in a fractured bedrock aquifer. Contain impaired groundwater within well head buffer area. Achieve drinking water criteria outside well head buffer area. Achieve hydraulic control in fractured bedrock aquifer within six months to isolate impaired groundwater from the well intake. Achieve hydraulic source control within one year. Reduce mass flux off site by 50% within five years so that hydraulic control at the well is no longer needed. Execute on site groundwater use prohibition within one year, and continue long-term management until off site groundwater meets drinking water criteria under natural flow conditions. State and federal regulations often require remediation within a reasonable time frame. For example, USEPA expects to return usable ground waters “…to their beneficial uses wherever practicable, within a time frame that is reasonable given the particular circumstances of the site”; see 40 CFR 300.430(1)(a)(iii)(F). USEPA does not, however, offer a specific numerical criterion for a reasonable time frame for remediation within its guidance or regulations. Determining a reasonable time frame for achieving and maintaining site objectives is a complex and site-specific decision. A generic period applied to all sites and facilities is not appropriate (ITRC 2010a). There are typically multiple remedy components at complex groundwater sites (see Table 10); each component may require many years to achieve interim objectives. For example, when monitored natural attenuation (MNA) is a remedy component, its implementation will run “for some time agreed upon by site owners, regulators, and stakeholders” (ITRC 2010a). *Note: survey responses total more than 100% because 5 survey respondents selected multiple answers. Timely remediation is frequently valued by RPs, regulators, and stakeholders. Because reasonable restoration time frame is not defined in regulations, early stakeholder engagement on this issue can help to build consensus. Lack of consensus-building on restoration time frame can result in site objectives that do not reflect site complexities and are therefore unrealistic or unachievable. The term “adaptive site management” refers to a comprehensive, flexible, and iterative process that can be used to manage the remediation process. NRC (2003) coined the term “adaptive site management” referring to “a comprehensive and flexible approach… for dealing with difficult-to-remediate hazardous waste sites over the long term” or where “…current technologies have proved to be ineffective in reaching site objectives for many types of contamination.” Adaptive site management can be used to make decisions in response to remedy performance, while considering changes in site conditions, the CSM, technology performance, and technological advances over time. NRC recommends adaptive site management at complex Superfund sites, noting that “adaptive management is not synonymous with ‘trial and error’” (NRC 2005). The adaptive site management process is instead a means to “…learn from, test, assess, and modify or improve remedies with the goal of meeting long-term objectives” (NRC 2007). Adaptive site management practices have been implemented at many sites, including the Watervliet Arsenal, New York (ITRC 2012). Develop performance metrics and collect monitoring data. Conduct remedy evaluations using site‐specific metrics. ITRC’s process for adaptive site management, as outlined in this guidance, is similar to the USEPA process and to NRC’s recommendations. Identify site challenges within the context of the CSM. Conduct a remediation potential assessment to decide if adaptive site management is warranted due to site challenges. Set or revisit site objectives. Develop interim objectives and adaptive remedial strategy. Develop a long-term management plan. Apply decision criteria to adjust, optimize, or reevaluate the remedy. Figure 1. Framework for remediation of complex sites. Although adaptive site management can be used at any site, it is particularly useful at complex sites. Adaptive site management does not need to be applied sitewide—simple issues can be addressed in parallel using existing processes. Because of the technical uncertainties of applying remediation technologies in complex settings, several iterations may be needed at complex sites. Compared to simpler sites, complex sites may use the same remediation technologies, but require multiple remediation technologies across the site and throughout the remediation process. Complex sites may also require more diagnostic tools and data collection to guide technology implementation. It may be appropriate to reevaluate site objectives to align them with achievable goals. Adaptive site management can be used at any stage of site remediation. The first steps of the adaptive site management process could be considered prior to the remedial alternative evaluation (such as the CERCLA feasibility study or RCRA corrective measures study). The adaptive remedial strategy could then be documented in the final remedy decision document. At other sites, a remedy may already be in place and adaptive site management practices could be integrated where appropriate. Adaptive site management goes beyond what is required under CERCLA or RCRA in assessing restoration potential, developing interim objectives, developing a long-term management plan, and following clear decision logic to refine the CSM and to adjust or even reevaluate the remedy. Note that the CSM may be refined at other times as a result of new data gathering. For simplicity, this detail is not shown in Figure 1. 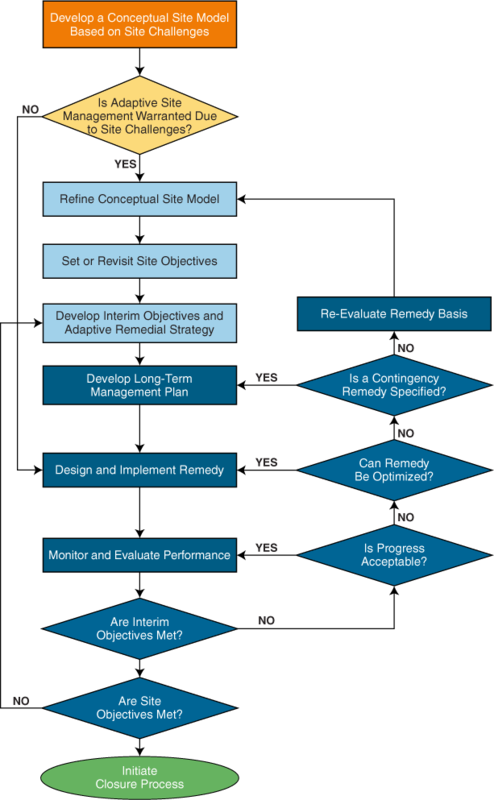 Site managers can also implement relevant phases of adaptive site management during remedy planning and implementation (remedy selection, remedial design, remedial action) or during long‑term management, which includes postconstruction phases of remediation management, monitoring, and evaluation of remedy protectiveness. Early stakeholder involvement and continuing engagement after remedy selection and throughout the remedy has proven successful at complex sites). Operable Unit (OU) 3 at NAS JAX includes several comingled chlorinated solvent plumes resulting from historical operations at over 100 buildings. Optimization studies and Five-Year Review results revealed several data gaps, prompting the NAS JAX Team to use adaptive site management to refine the CSM, determine key exposure pathway risks, and develop a comprehensive remedial approach. Several pilot studies and ESTCP demonstrations of innovative tools and technologies have been conducted. Source area DNAPL and the risks of VI and contaminant migration to surface waters have been evaluated. An FS Addendum is being completed. More details are provided in the full case study. Sites that have already selected a remedy may choose to integrate existing site operations into the adaptive management process by establishing interim objectives. Interim objectives can be developed for each component of the remedy, along with specific, relevant, and time-bound performance metrics. The next steps are remedy implementation, monitoring, and evaluation. Remedy performance is evaluated routinely against performance metrics to keep the remediation on track to achieve interim objectives. If performance is not acceptable, the remedy can be optimized, if feasible, replaced with a contingency plan, or reevaluated. Remedy reevaluation is a process that consists of refining the CSM to better describe site complexities, reevaluating site objectives if needed, and modifying the remedy. Adaptive site management ends when all interim objectives have been met, site objectives have been achieved, and the closure process has been initiated. If a “no further action” site objective is unachievable or otherwise not applicable, then the remediation process may include long‑term management of the site or portion of the site. Groundwater Remedy Completion Strategy: Moving Forward with the End in Mind (USEPA 2014b). The purpose of this guidance is to “… help focus resources on the information and decisions needed to effectively complete groundwater remedies and to ensure that these remedies protect human health and the environment.” This guidance also provides a technical and scientific process for evaluating whether sufficient data have been obtained to assess the likelihood that a groundwater remedy has or will achieve the site objectives in a reasonable time frame. Additionally, DOD recognized the problem of complex sites many years ago and issued relevant guidance (United States Army 2002). In a more recent publication, the NRC described “transition assessments” as an approach to manage remediation decision making at complex sites that already have a remedy in place, but have reached asymptotic performance (NRC 2013).